Our hearts are small in size but have a big job. The heart is a muscle that needs to be kept strong through not smoking, participating in daily physical activity and by eating healthy. 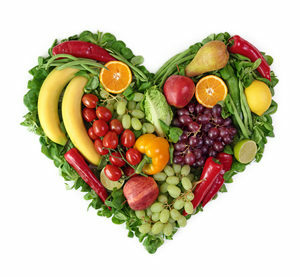 Certain foods have been proven to be good for your heart’s health. By eating these foods you will protect your heart and blood vessels and keep your heart in tip-top shape. Berries, Blueberries, Strawberries, Raspberries –These delicious berries are full of color, fiber and vitamin C. They have disease fighting antioxidants that protect cells from free radical damage. Eat them fresh as a snack, as a salad or add them to plain Greek Yogurt or whole grain cereal. Salmon –This fatty fish is a great source of protein and is packed with omega-3 fatty acids. The American Heart Association advises eating salmon and other omega-3 rich foods like flaxseed or spinach twice a week for heart health. If you do not like salmon, try other omega-3, oily fish like tuna, mackerel, herring and sardines. Oatmeal –Oats are fiber-rich, full of folate, magnesium, potassium and omega-3 fatty acids. Research has shown that whole grain oats lower cholesterol levels, keep you regular, full and may help prevent certain cancers. Olive Oil –This oil is a monounsaturated fat that lowers the bad LDL cholesterol and reduces your risk of developing heart disease. Other examples of monounsaturated fats include: avocados, peanut butter, rapeseed, walnut, canola, and peanut oils. Nuts –Nuts like almonds and walnuts are filled with omega 3 fatty acids, healthy fats like mono-and polyunsaturated fats, and are packed with fiber. Eat a handful of these unsalted, tasty nuts by tossing in a salad, in pasta or eat in a trail mix. Soy Protein –Do you want to eat a high-quality vegetable protein that contains fiber, polyunsaturated fats, vitamins, minerals and is also inexpensive? A diet full of soy protein can lower triglycerides, which can help prevent cardiovascular disease. Stir-fry some tofu with vegetables, eat edamame, and drink a smoothie made with soy milk.